Before I begin, I wish to thank the Detroit Symphony Orchestra for assisting me with coverage of this festival. I also wish to thank all the colleagues who accompanied me to witness this, and also my mother and father, Shirley and Dennis. Beethoven's Ninth is perhaps the most iconic work in musical history. That said, all nine symphonies constitute the arguably the most significant symphonic canon there is. 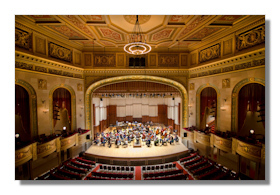 Leonard Slatkin and the Detroit Symphony Orchestra deserve enormous credit for presenting the Detroit area with this epochal cycle, and I am equally thrilled that Orchestra Hall appears revived by the project. For those of you who may have missed the earlier reviews, I will recap the cycle briefly. Symphonies 3 and 8 were well played, while hardly offering the last word in excitement. The second installment featured Symphonies 4 and 5, which were unquestionably excellent. The third installment was to this point the cycle's high water mark, with a gloriously phrased Sixth Symphony and staggering playing. The fourth installment was controversial due to a unorthodox conception of the Seventh. Still, many people enjoyed that portion as well, and overall I was thrilled by some truly superb ensemble and interpretive insight. All eyes were on the Ninth. This performance was a stunning achievement, a true testament to the Detroit Symphony and to the gifts of Leonard Slatkin. First on the program was a set of pieces from The Creatures of Prometheus. None of these pieces – even the overture – are especially well known today. They proved an inspired choice, for this is Beethoven are his most exuberant and charming. The overture is reminiscent of the great Sixth in its danceable charm. Since the performance of the symphony was one for the ages, it was no surprise that the overture was equally successful. The hallmark of the festival has been superlative wind playing, and they again showed their great skills. The strings and brass were also in fine form. The glorious adagio is heartfelt and tender, and is notable for Beethoven's use of a harp. It is a lovely, gentle piece which also features solo passages for cello. They were beautifully played by outgoing Principal Robert deMaine, a tremendously gifted artist who has been a true leader over the years and throughout the festival. The audience acknowledged his contributions with loud and enthusiastic applause. It's a piece that probably should get played more often, but probably won't, because of its unusual scoring and relative obscurity. With the finale, the joyous themes of the overture return, and the DSO whipped itself into a roaring conclusion. The Ninth has doubtless played a large part in Leonard Slatkin's musical life. His last performance at the Hollywood Bowl was very warmly received. Letting his hair down and playing the piece for all it was worth, he nevertheless held some surprises. Firstly, while the rest of the festival had featured feet and nimble tempos, Slatkin's Ninth was a surprisingly traditional conception. Secondly, a slight change to the repeats in the scherzo – alluded to in the conductor's introductory letter – was probably unnoticed by many but was nevertheless very interesting. Frankly, the Ninth responds more than any other Beethoven symphony to different interpretive approaches. The massive scale of the work allows for a more romantic view to be taken, which was the choice here. After a measured introduction, the full power of the DSO was unleashed. This was a performance that gathered strength as it went, coming together halfway through the first movement. Like other performances in the festival, it combined a great deal of excellent playing with rock-solid interpretation. There really isn't anything worse in a symphony such as this than excessive micromanagement, and Slatkin has unwaveringly presented interpretations that allow the music to speak for itself. To his credit, the traditional tempos didn't create a loss of excitement; climaxes were shattering and everything was spot on. One of my major complaints was resolved here, as I had complained that attacks on notes had been a touch muted. Here, the strings slashed, the winds were bucolic, and the brass thankfully cut through everything without turning crude. It became very clear early on that Slatkin and his orchestra were revved up for the occasion. A blistering scherzo followed, never feeling rushed or strained. Finally, after four installments, the brass sounded comfortable and soared. While keeping with the generally traditional approach that had been established, the agility of the strings and winds kept anything from being flat-footed or dull. But it was the adagio that showed the orchestra's genuine greatness. It is a movement of dangerous placidity, and can turn stale in less capable hands. Slatkin's innate musicality and trust in his ensemble paid huge dividends in this breathtakingly fluid performance. The strings shimmered with a beauty that had only been previously hinted at. This was the kind of sound that world-class ensembles make; a fortissimo is undoubtedly impressive, but soft playing is far more difficult and ultimately more rewarding. As the adagio drew to a close, the tension in the room was palpable. A forceful introduction to the finale led into magnificently played variations on the "Ode" theme, and from that came Jason Grant's confidently phrased solo. It was a touch legato, but better that than barking and choppy. Backed by wonderful orchestral contributions, the UMS Choral Union entered with gusto. This huge chorus clearly articulated and sang fervently, raising the excitement by several notches. The solo contributions were less pleasing. Such was the adrenaline level in the house that soprano Joni Henson overdid her solos, although a Sunday DSO webcast showed her in better form. Mezzo Kelley O'Connor lacked the projection to battle with Henson, but what could be heard was lovely. Vale Rideout sang well. After the glorious choral refrain, Rideout took center stage with a fine tenor solo. While not erasing my memories of the great tenors, he and the UMS chorus worked well together and set the stage for the great explosion of sound after the march. Absolutely ravishing strings and full-throated singing rang throughout the hall, with the brass in such excellent form that I wondered why the previous weeks hadn't been this excellent. Slatkin proved himself an absolute master of his charges, steadily pushing the tension higher and higher until the symphony's marvelous conclusion. The crowd exploded, prompting several happy curtain calls. After three exhilarating weeks, Slatkin and the DSO deserve nothing but praise for this magnificent achievement. In front of huge crowds full of newcomers and old-timers alike, he and his orchestra convincingly delivered us Beethoven's symphonic canon. As an estimated 8,000 people saw the Ninth this weekend, it can surely be counted as a triumph in what has been a challenging period for the ensemble and those who run it. While other complete cycles both live and on disc have perhaps offered more insight for better or worse, Slakin's insistence on letting the music do the talking remains a valid approach. I can therefore strongly recommend you purchase the complete symphonies with these forces electronically at www.dso.org. I sincerely hope that the excellence on display here will continue to create interest in this great orchestra and venue, and stand as a testament to an outstanding partnership.